The last time you thought about Zimbabwe was probably during the news outbreak when Cecil the Lion was killed in July 2015 by an American dentist or when Mugabe hit the headlines, but there is a lot more to the country than hunting and political scandals. 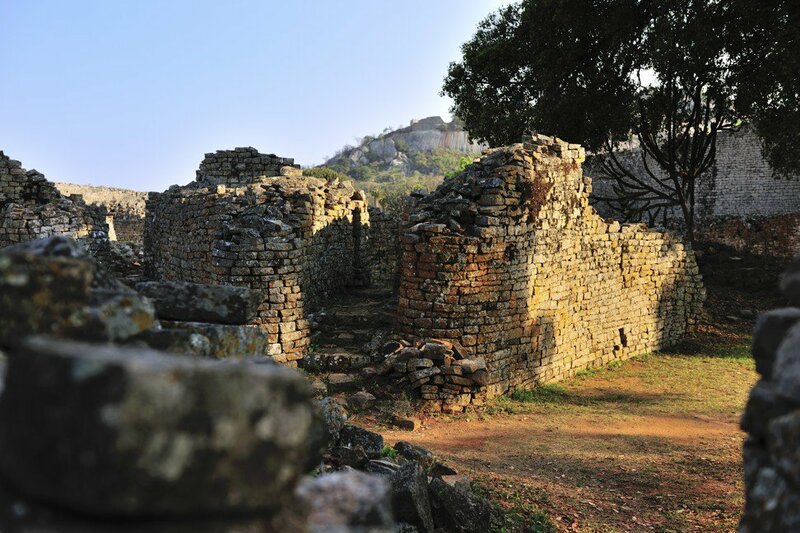 Zimbabwe is home to “the friendliest people in Africa”, and lucky travellers can find baby white rhinos, giant man-made lakes, zonkeys and exclusive access to inland pools teeming with wildlife – it is no wonder that Zimbabwe has been making a name for itself as a magical place to visit. 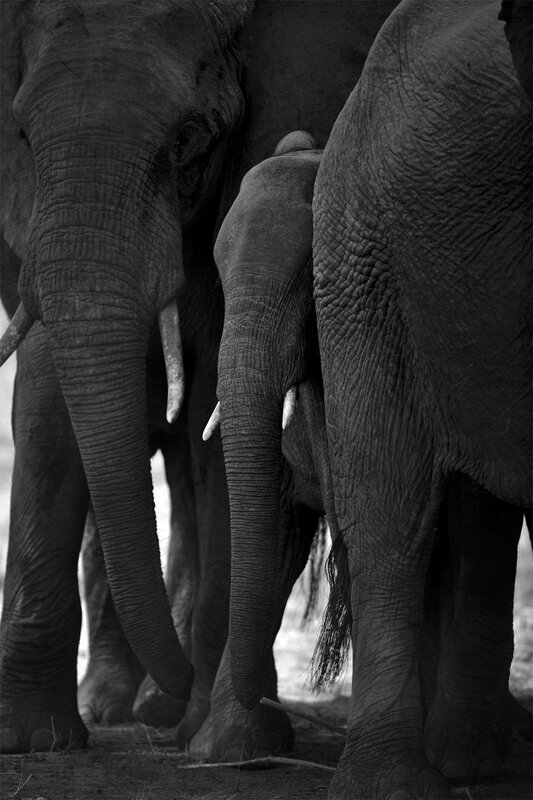 Herds of elephants are a common sight in the reserves. Our first stop is Singita Pamushana in Malilangwe Wildlife Reserve, the number one luxury lodge in Zimbabwe, owned by an American billionaire with a passion for Africa. Singita Pamushana is also proof that with big money, big things can be done. The elusive white rhino can be found near the lodge, along with elephants, lions, leopards, klipspringers, impalas, kudus, elands, waterbucks and the wild dogs. Rhinos were reintroduced here a while ago, bought from South Africa with a serious price tag. Now they are heavily guarded to protect them from poachers who use helicopters to track and kill the animals. “One horn is worth around US$350,000,” our guide says. While the rhinos in Malilangwe Reserve are well protected, almost 700 have been killed this year alone in South Africa. Often their faces are cut off. The innocent baby rhino we are privileged to see today, a couple of months old, may well be the last generation of its species. Conservation efforts are notable in Zimbabwe. 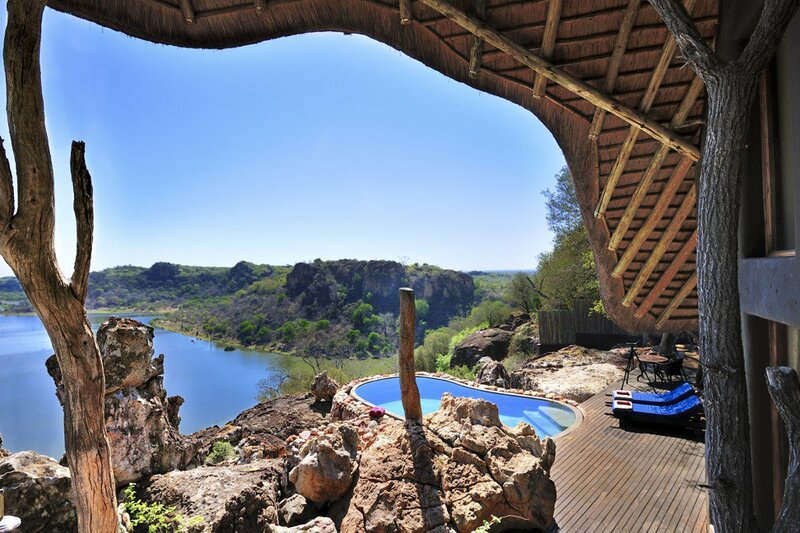 We meet Clive Stockil, owner of Chilo Gorge Lodge and a renowned conservationist, in front of the sandstone Chilojo cliffs in the neighbouring Gonarezhou National Park, near the border with Mozambique. In the 1980s, Stockil was one of the first people to take action to try and stem the declining number of rhinos in Africa. A few months ago, he received the first Lifetime Achievement Award from the Tusk Trust Conservation, awarded by its royal patron, Prince William. Not long after we visit, Stockil flies back to England to give a speech at the National Geographic Society in London. When we meet Stockil, here in his beloved Gonarezhou National Park, he looks more like a tough scout than someone who only a few weeks ago was shaking the hand of a prince. Wearing shorts, a straw hat, with a pair of Swarovski Optik binoculars around his neck and sporting a serious grey beard, Stockil has an intense gaze. He also has a firm handshake. Not one for idle chitchat, Stockil accelerates into fifth gear when it comes to nature protection. Conservation efforts are notable in the real wild of Zimbabwe. You can join a tour or find a guide to explore the parks. “[Gonarezhou National Park] is not as well-known as other parks in Zimbabwe, but that is what makes it so interesting. This is the real wild. You almost never see another car; the animals are not used to seeing 4x4s, so you have to make a real effort to find them.” Both in this park and the Savé Valley Conservancy, Stockil is working hard to reintroduce rhinos, elephants and wild dogs. Other national parks in Zimbabwe transport their rhinos to his private concession because here they have a greater chance of survival. Stockil explains how rhinos and elephants are hunted today with hi-tech apparatus, silenced weapons, helicopters, fast cars and poison. “Poison is injected into fruit so that the animals die without much effort, or poison is simply poured into waterholes,” Stockil says, calling it “a weapon of mass destruction”. Hundreds of elephants die in this way, as well as other wildlife that feed off their carcasses. The wildlife is impressive too. Ever heard of zonkeys? 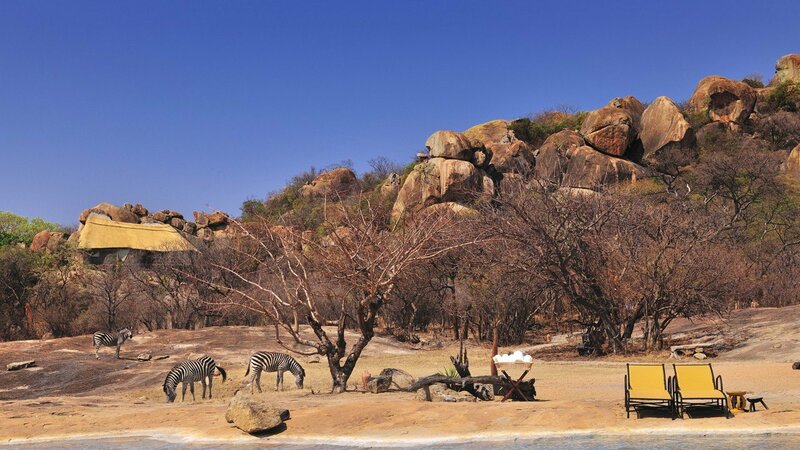 They are zebras that get too cosy with donkeys, and can be seen around Camp Amalinda near Matopos National Park. Another rare sight, albeit more of the flora than fauna kind, can be found in a particularly wild corner of Zimbabwe – the remote Mana Pools. The name “Mana” means four in the local Shona language, and the park is named after the four large pools, fed by the Ruckomechi River, that lie inland from the Zambezi. Hippos, crocs and a wide variety of aquatic birds are found near the pools, all of which can be seen by canoe. There’s no way to get here by driving, the only option is to fly in and disconnect from the rest of the world. We land on an airstrip close to Kanga Camp, which hovers over a mirror-like vlei, a shallow lake. Kanga has only six comfortable and well-appointed tents, looking out over the vlei, surrounded by thick Mopane woodland and lush riverine forests. The views from the lodges are spectacular. Visitors can enjoy the tranquillity of the surroundings. This area is a playground for lions. Last season a lioness had her babies underneath one of the decks of a tent at Kanga Camp. 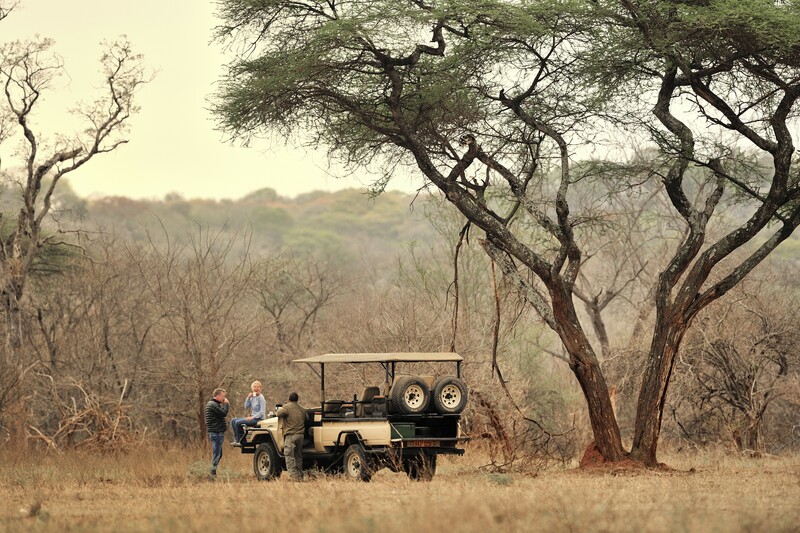 The team had to drive the guests away from the main area to their tents without interfering with nature. No walking is allowed here. The wild animals come first. There are examples of man-made beauty alongside nature, however. Just a short flight from Mana Pools is Lake Kariba, the biggest man-made lake in the world. It is a huge body of fresh water spread 5,200 square kilometres along the border with Zambia. Its glittering blue waters lapping over red sand transforming into thick forests are a favourite haunt of Zimbabweans, who come to relax on house boats for a spot of fishing, although no swimming is allowed because of crocodiles in the water. Nevertheless, wildlife protection is a constant in everyone’s minds. The next day, we head to the vast playgrounds of the late Cecil the Lion. Cecil is gone, but his pride is still here, roaming around the stunning Somalisa Camp in the massive Hwange National Park. This recently rebuilt camp is hidden on an acacia island right on the edge of a seasonal flood plain. Each of the seven luxurious Sail tents looks out over the grasslands. Often large elephant herds pass by and even through the camp to drink from the natural water hole or the artificial pool with fresh water. As the sun sets and the bright moon rises, I watch a herd of elephants go for a drink at a little pond in front of my lodge. A mother scrutinises me as she urges her baby to have a sip of water. A moment passes, I relax, she relaxes, and time stands still for a couple of seconds in magical Zimbabwe. 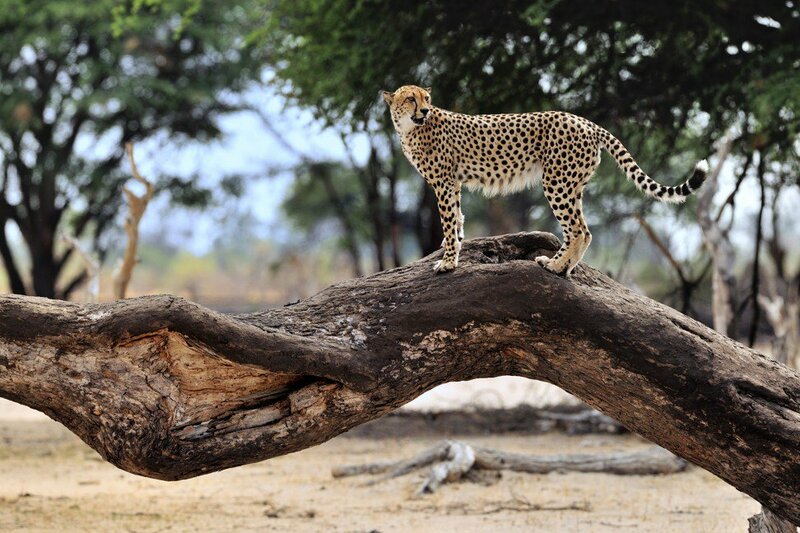 A leopard perched on a tree is a common sight in Zimbabwe’s national parks. the prices (in US dollars because this is the currency now) are low. ● Another must-eat is Zimbabwean biltong, a popular type of dried meat. In some supermarkets you can buy it fresh and pay per kilogram. You can also buy a packaged variety with different meats: kudu, springbok, beef with or without chilli. It is a fantastic snack while on a road trip. ● Have a drink or lunch in the courtyard of the Bulawayo Club and peek inside the old bar where expats often come to watch sports or get together. If you are a member of the club you get a discount. The restaurant serves excellent and affordable lunches and dinners in its inner courtyard where pleasant jazz tunes fill the air. ● There is no better spot than the terrace of the Victoria Falls Hotel to order a gin and tonic in the Stanley’s Bar and enjoy the colonial setting of this grande dame. 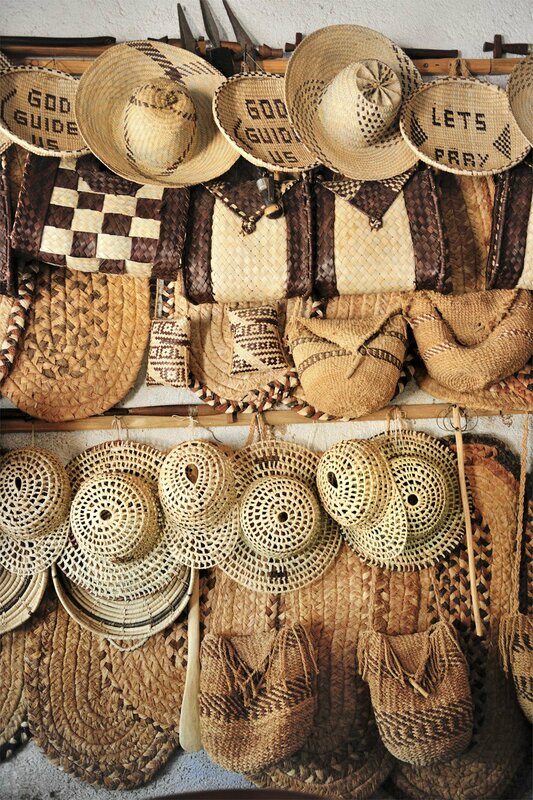 Grab the chance to check out some of the handicrafts by the locals. ● We travelled with Safaris 4 Africa, a local travel agent that can arrange the complete trip from A to Z and knows all the camps in this story. ● You can fly with Qatar Airways from Hong Kong via Johannesburg to Harare from HK$11,380 included. ● To travel to Zimbabwe, you need a valid passport with at least three blank pages. At the airport you can easily and quickly buy the visa, which costs around US$50. ● There is malaria in Zimbabwe, so take precautions against insects by wearing protective clothing and using mosquito repellent. Consult your doctor about which medication and vaccinations to take.